According to the V.P. of Chrysler Motors of California at the time, before the war, auto assembly plants in Southern California had employed 4900 persons and assembled 850 cars a day. 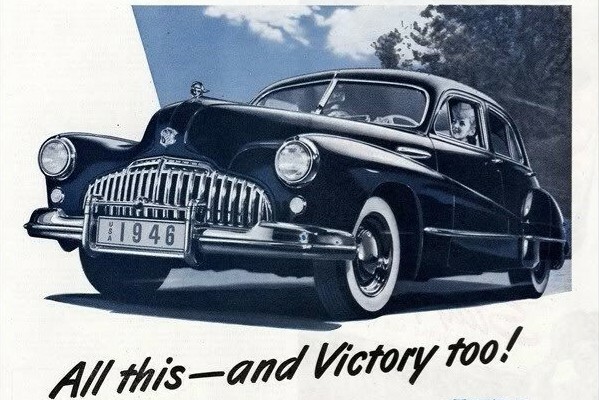 Passenger car production ceased in early 1942, and the big automakers switched to defense work. In the summer of 1945, with victory in Europe achieved, some automakers began to manufacture small numbers of passenger autos again. 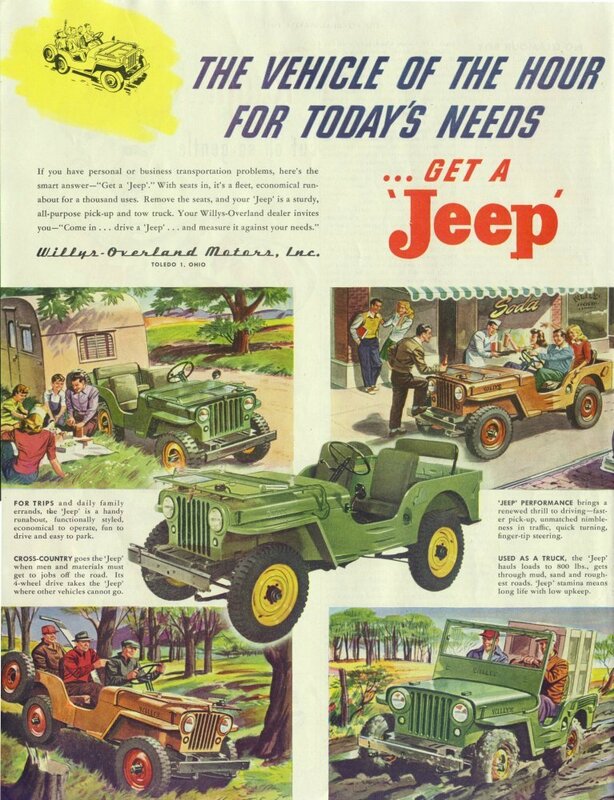 Then following V-J Day, on August 24, 1945, the War Production Board gave automakers the green light to resume unlimited production. In September 1945, GM’s South Gate plant turned out the first Chevy truck to be assembled since Pearl Harbor. Assembly of Buicks, Oldsmobiles and Pontiacs was likewise expected to get underway soon. Also in September, the Ford assembly plant at Long Beach began preparations to go back to work, having been leased by the Army Air Forces as a storage plant for the duration. 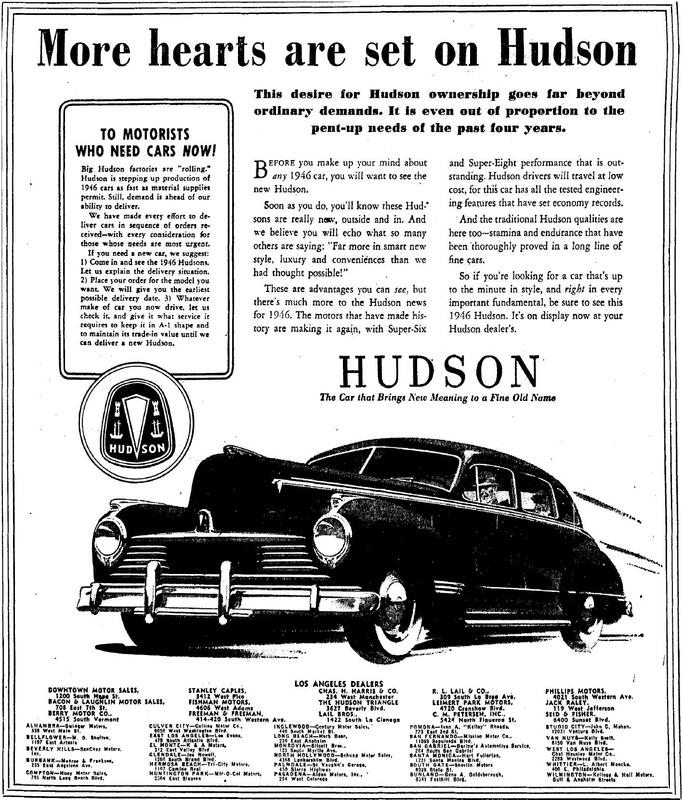 The first passenger car, a tudor sedan, would be completed, fittingly, on December 7, 1945. 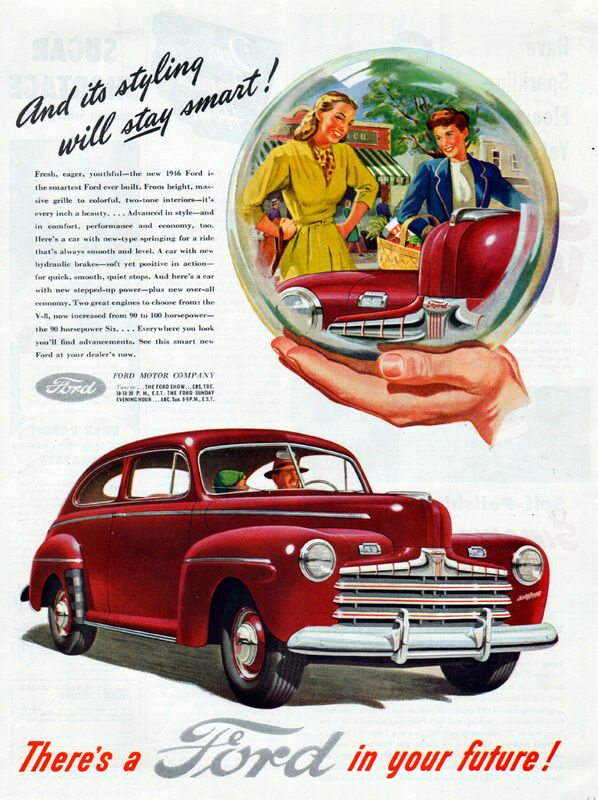 There may have been a Ford in your future, but it was not likely in your driveway in 1946. 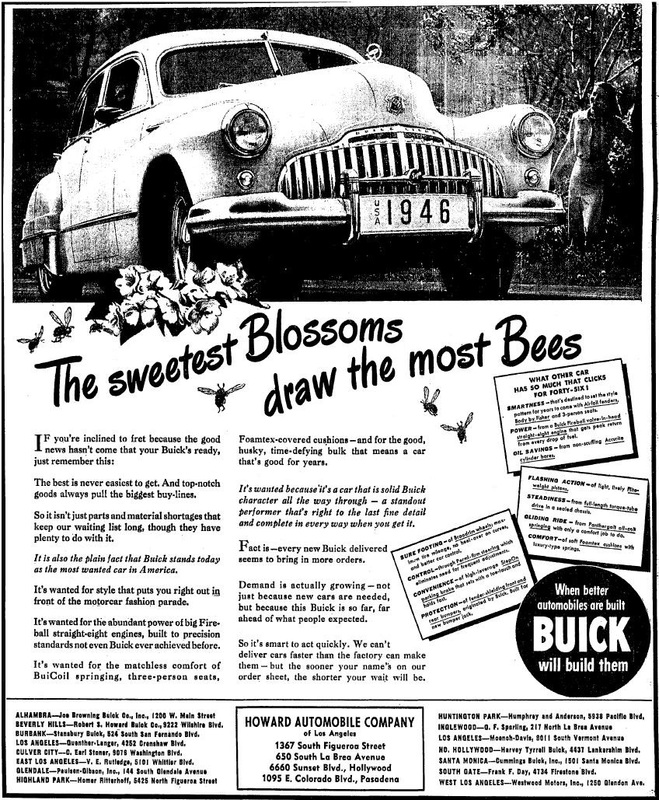 In October, the first postwar Buicks were displayed in Flint Michigan. They looked long and low, with “airflow’ fenders extending along the door panels, and chrome-plated grills with wraparound bumpers. The first batch, mostly Series 51 Super 4-door sedans, arrived in Los Angeles for display at the Howard Automobile Company’s showrooms on November 9, 1945. They also had a special display at the Bullock’s department store’s men’s shop on Hill Street November 19-28, 1945. As a loyal Buick man, Avery would be sure to get down here and see them. 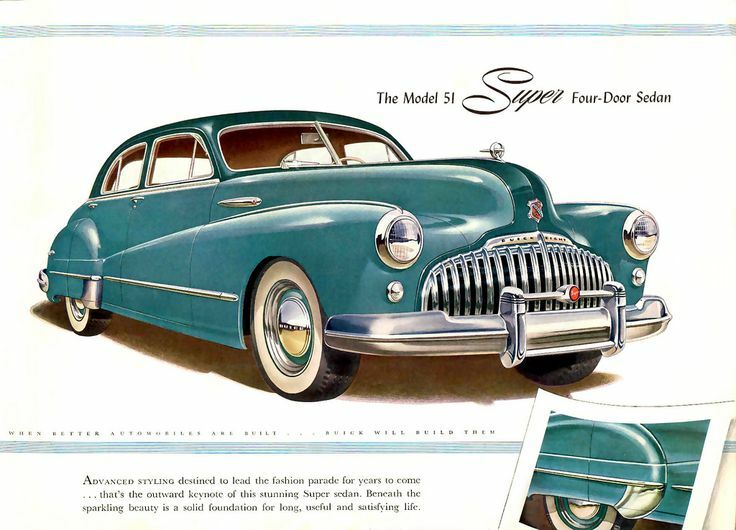 A Buick Model 51 SUPER 4-Door sedan, 1946. Buicks at Bullock’s Men’s Store on Hill Street. 11/19/45. In December, while those first new Fords were being readied for delivery out of Long Beach, Mercury and Lincoln dealers gathered at the Ambassador Hotel for a preview of the new models. 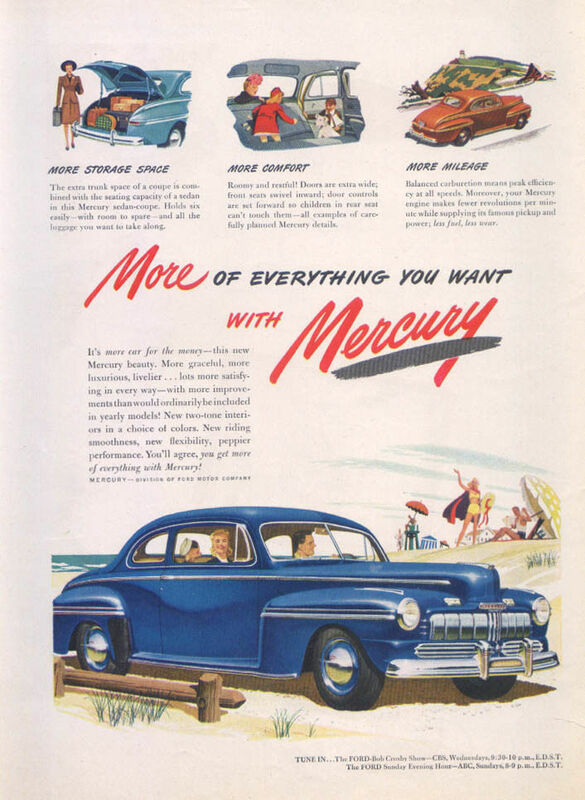 Mercury cars went on display to the public on December 14 at Tupman Motors, Figueroa and Jefferson. 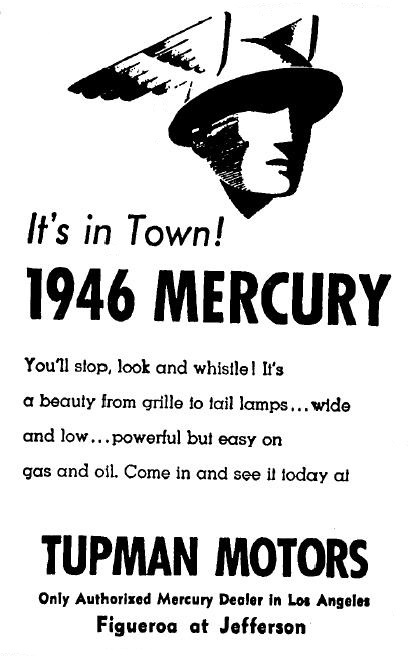 “More of everything you want with Mercury,” 1946 (except, perhaps, a Mercury). 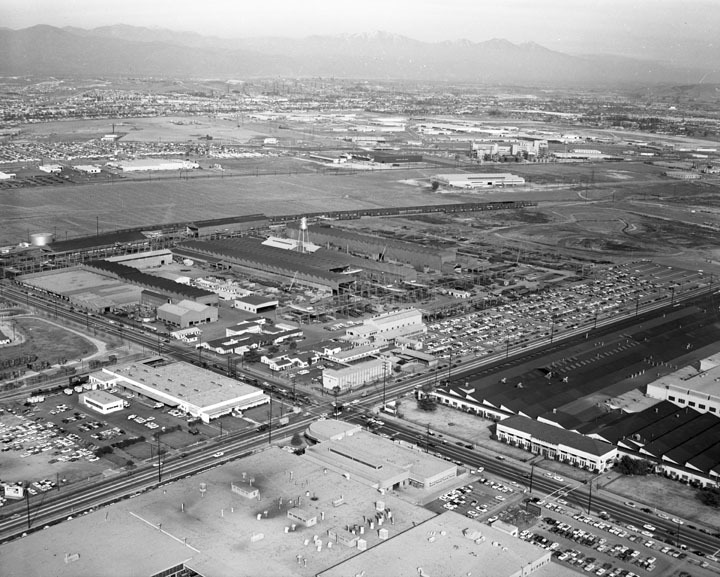 A couple weeks later, on January 3, 1946, Ford broke ground for its new assembly plant at the southwest corner of Eastern and Slauson, across from the existing Chrysler assembly plant. Benson Ford and his wife were on hand to shovel the first spade of earth. This plant would assemble Lincolns and Mercury cars, at a rate of 250 a day. In February 1946, the new Studebaker Champions and Chrysler Royal sedans arrived for display in Los Angeles. Paul G. Hoffman hosted a Hollywood-premiere type event to welcome the Studebaker Champions to his 7th and Figueroa showrooms. 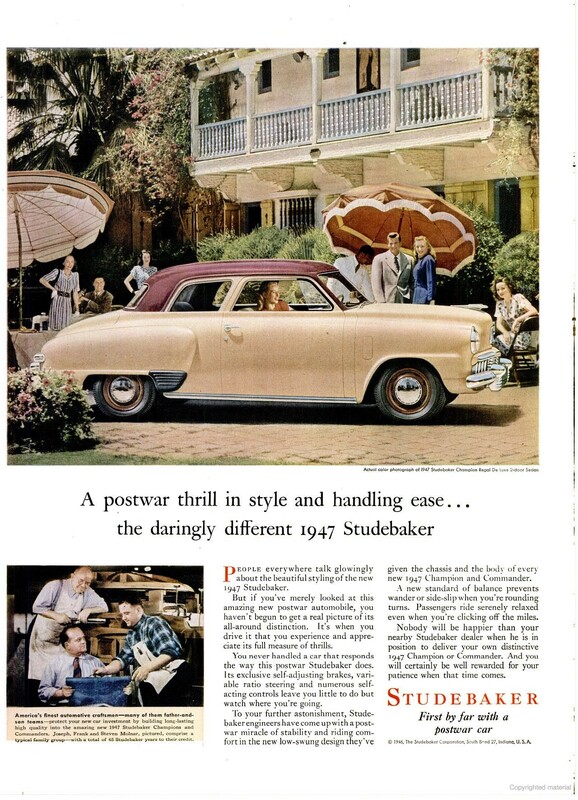 “The First By Far with a Postwar Car.” The 1947 Studebaker Champion. 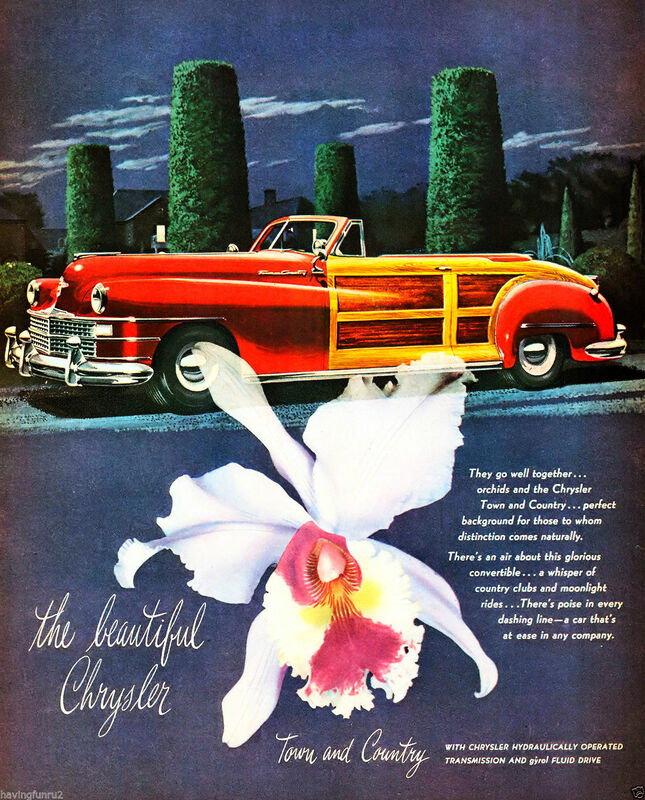 The beautiful Chrysler with fluid drive, 1946. 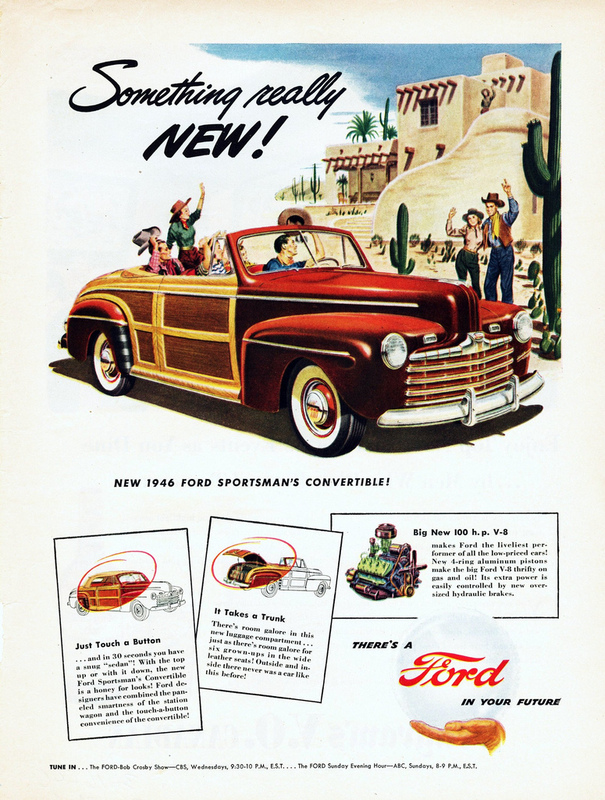 The Sportsman wood-sided convertible, Ford’s answer to Chrysler’s Town and Country, was advertised in March 1946. 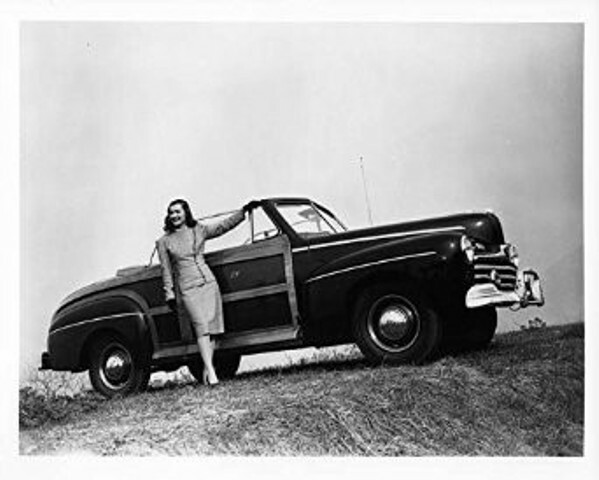 Ella Raines with a 1946 Sportsman convertible, customized with her initials. 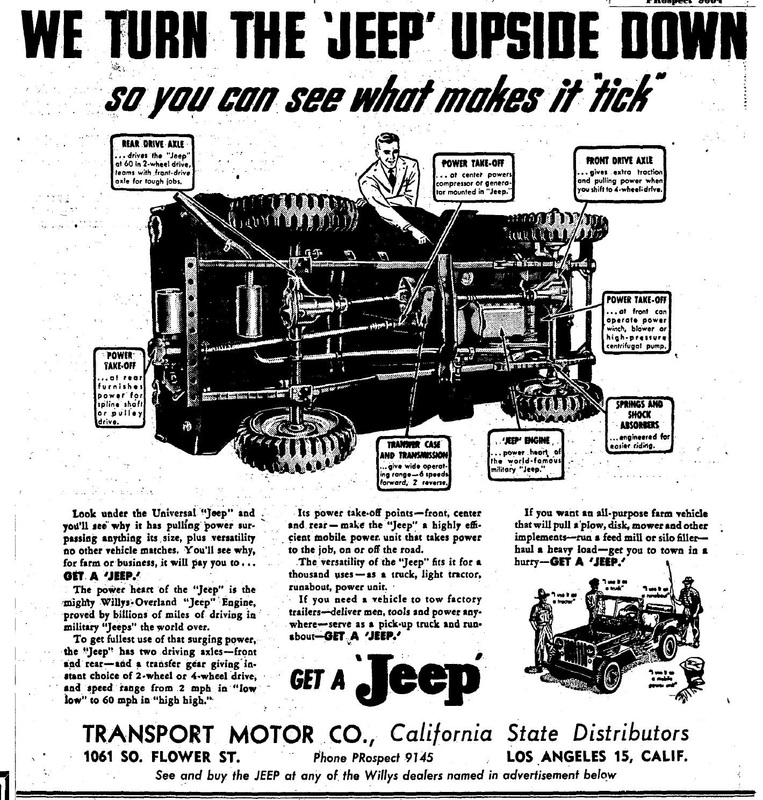 You could get a “Jeep” from the Transport Motor Co, Willys-Overland’s statewide distributor, at 1061 S. Flower. 3/24/46. For all the excited promotions, however, automakers were having a tough time keeping up with the demand due to materials shortages, delays in parts shipments and other factors. Chrysler would have to shut down its passenger car production at the Los Angeles assembly plant on May 10. Ford’s Long Beach plant did the same on May 17. Don Lee Cadillac, headquartered at 7th and Bixel streets was displaying the new Cadillacs in April. 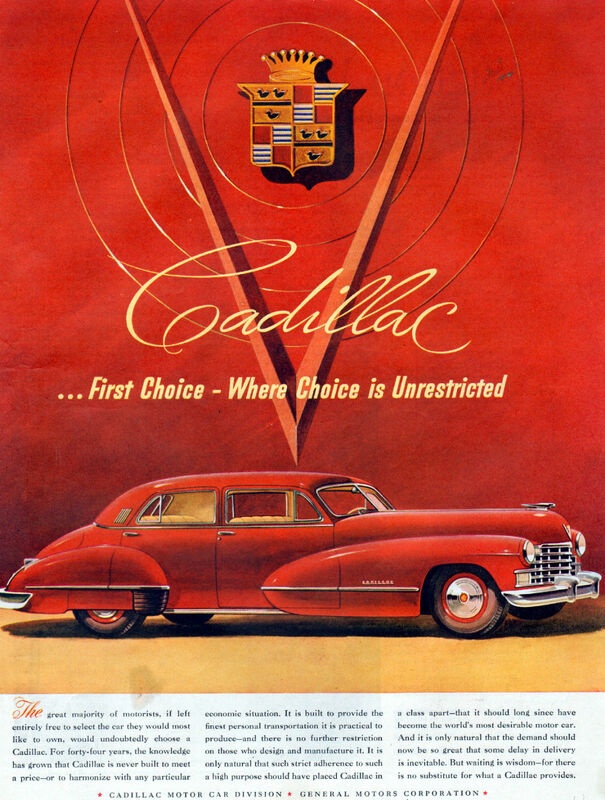 “When choice is unrestricted” Cadillac 1946. 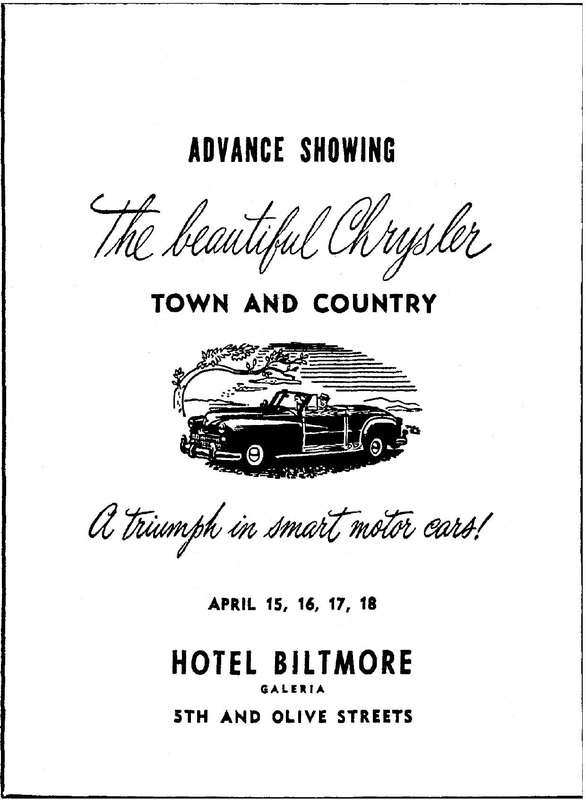 Chrysler exhibited its fabulous new Town and Country wood sided model at the Biltmore Hotel’s Galleria from April 15-18, 1946. The cars had not yet been placed in dealers’ hands, however. 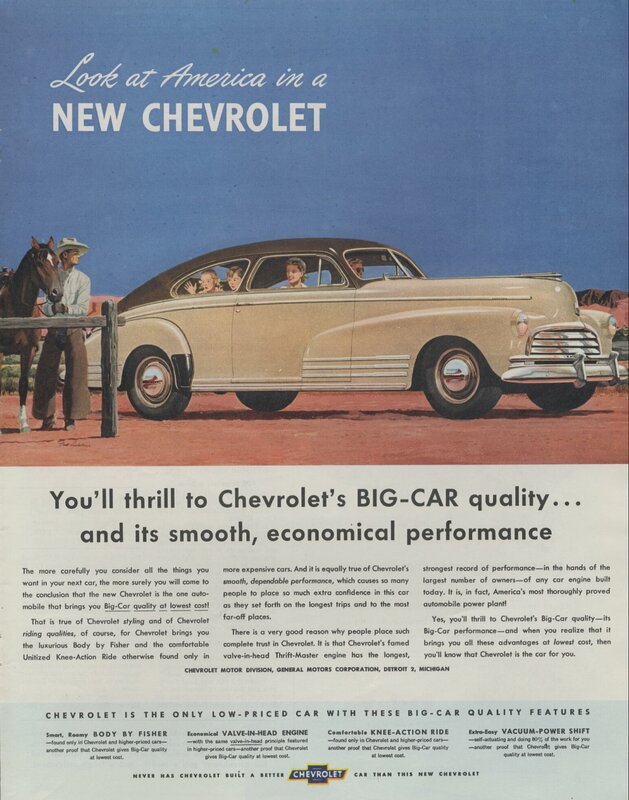 Chrysler Town and Country ad, 1946. 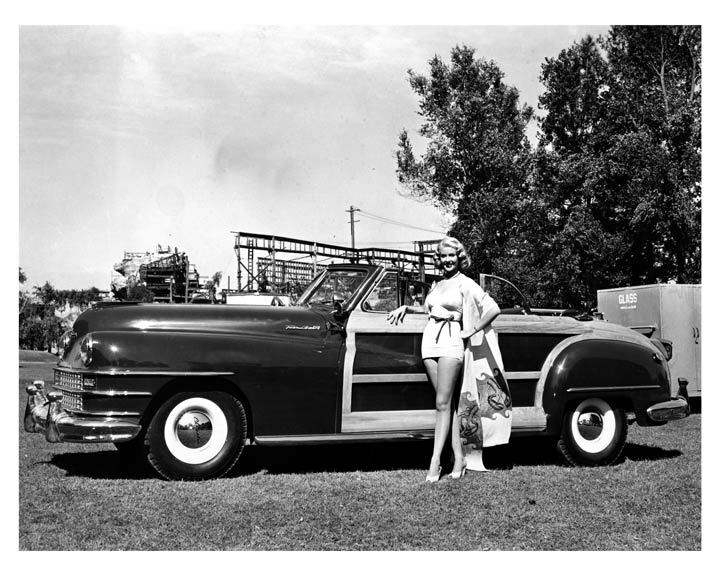 Marie McDonald posing with a 1946 Chrysler Town and Country convertible. From April 17-20, Los Angeles would see the new Lincoln Continental Cabriolet at J.E. 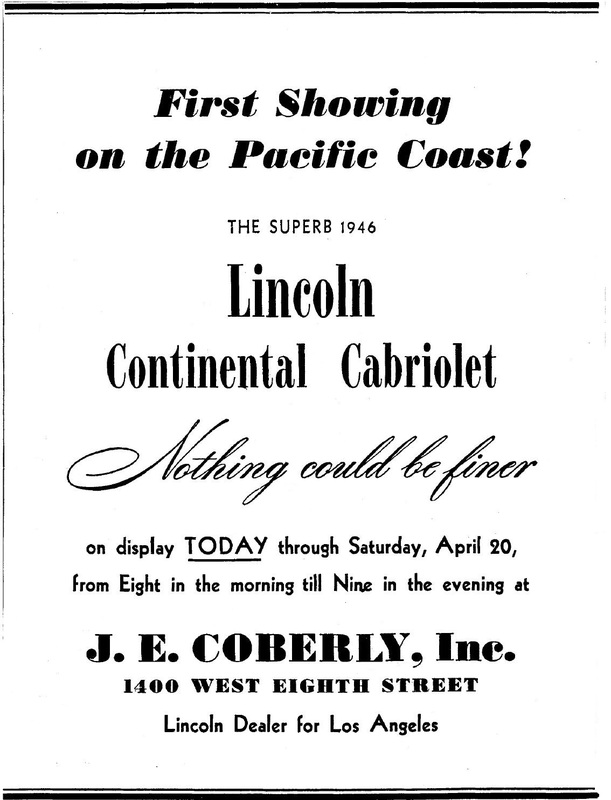 Coberly’s, 1400 W. 8th St., the first showing on the Pacific Coast. “Nothing could be finer” (except actually getting your hands on the car). 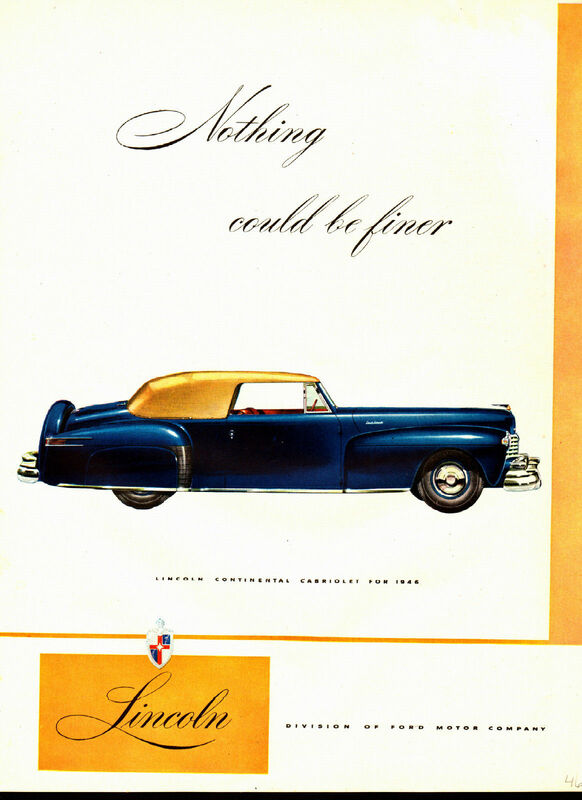 1946 Lincoln Continental Cabriolet. 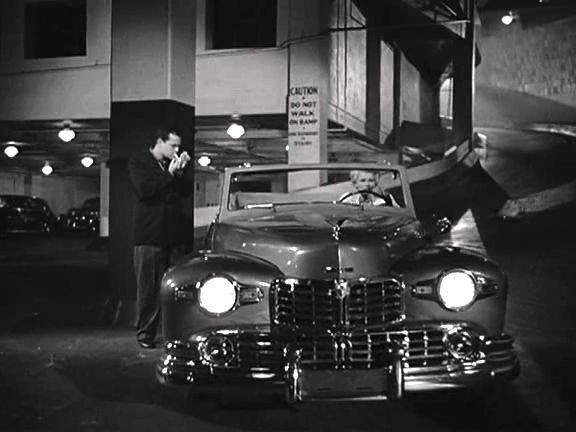 Rita Hayworth at the wheel of a 1946 Lincoln Continental cabriolet from The Lady from Shanghai IMCDB. 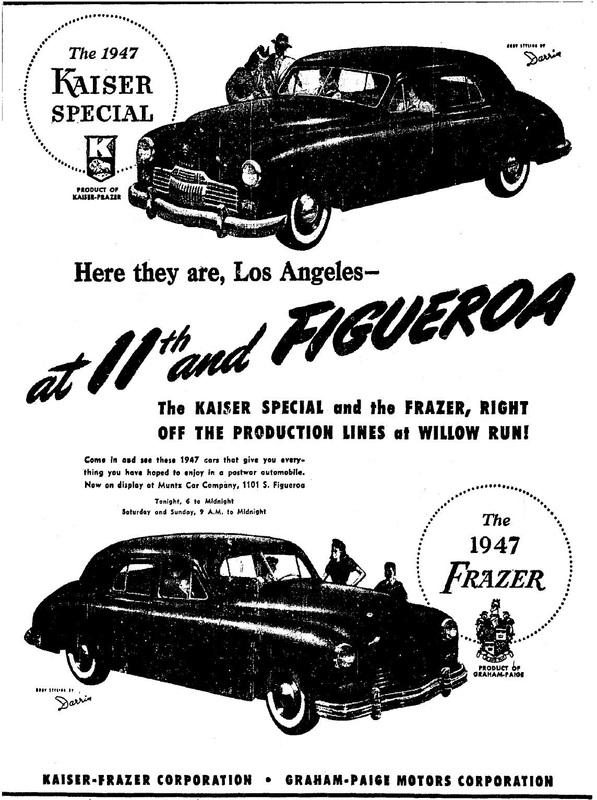 Between June 28-30, industrialist Henry Kaiser and partner Joe Frazier exhibited the 1947 Kaiser Special and the 1947 Frasier at the “Mad Man” Muntz Car Co. 11th and Figueroa. Kaiser, who was engaged in shipbuilding during the war, was also building affordable housing in the Los Angeles area with Fritz Burns as Kaiser-Burns Homes. 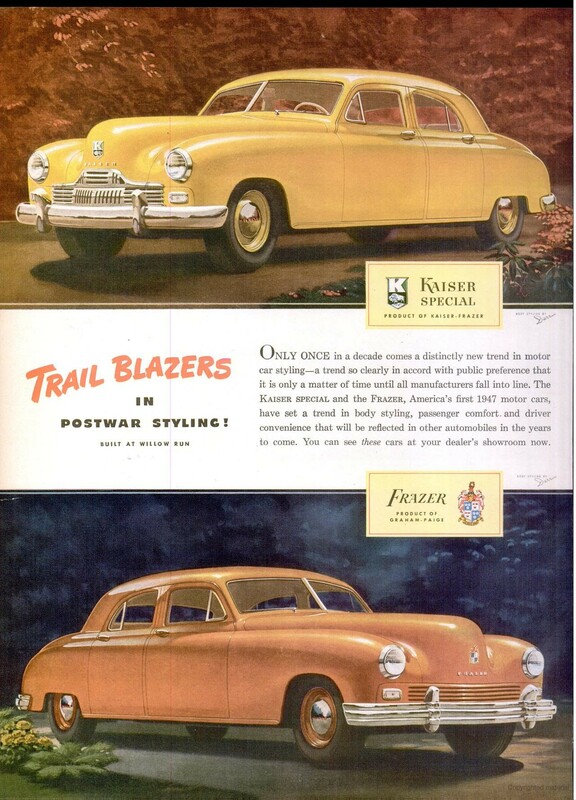 “Trailblazers in Postwar Styling.” The 1947 Kaiser Special and the Graham-Paige built Frazer automobiles, 1946 ad. That same month, GM’s South Gate plant resumed assembly. 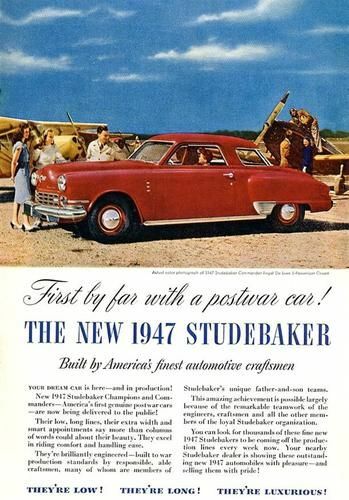 Studebaker’s Vernon plant, having spent the war years making bomber engines for the Army and Navy, began reconverting for passenger car assembly, and expected to be able to start turning out 1947 models within a few weeks. Ford anticipated that Long Beach would be running again in July. 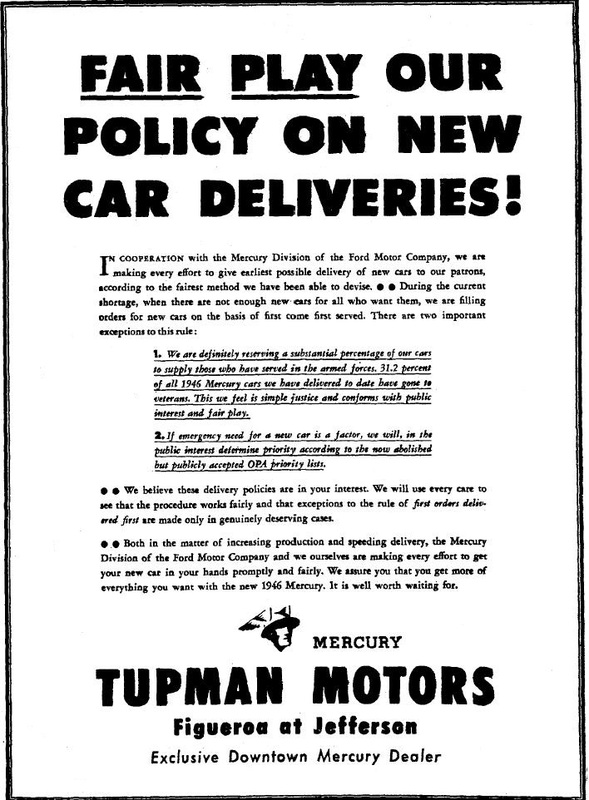 The automakers decided to take a straightforward approach with customers about their limited delivery situation. 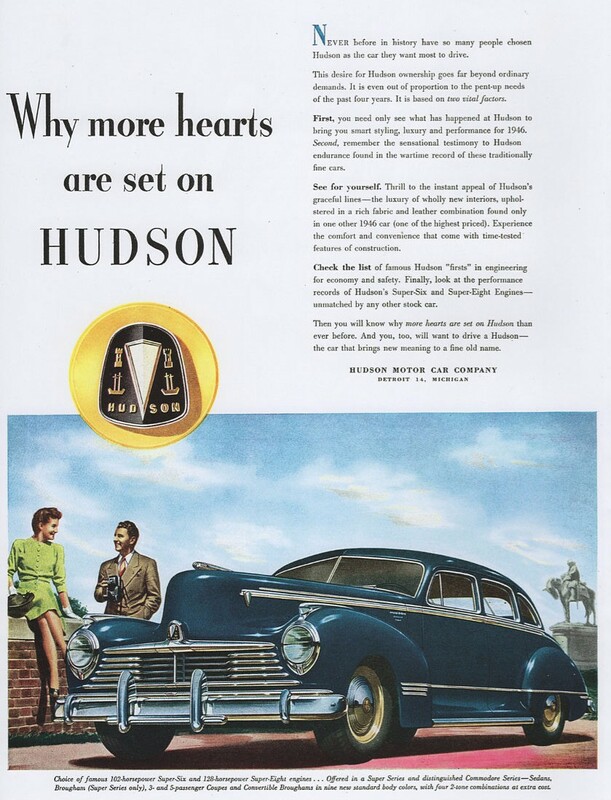 1946 Hudsons went on display here in August, but as the company explained: “Hudson is stepping up production of 1946 cars as fast as material supplies permit. Still, demand is ahead of our ability to deliver.” 8/4/46. August also saw Packards on parade at Earl C. Anthony’s 1000 S. Hope St. showroom. 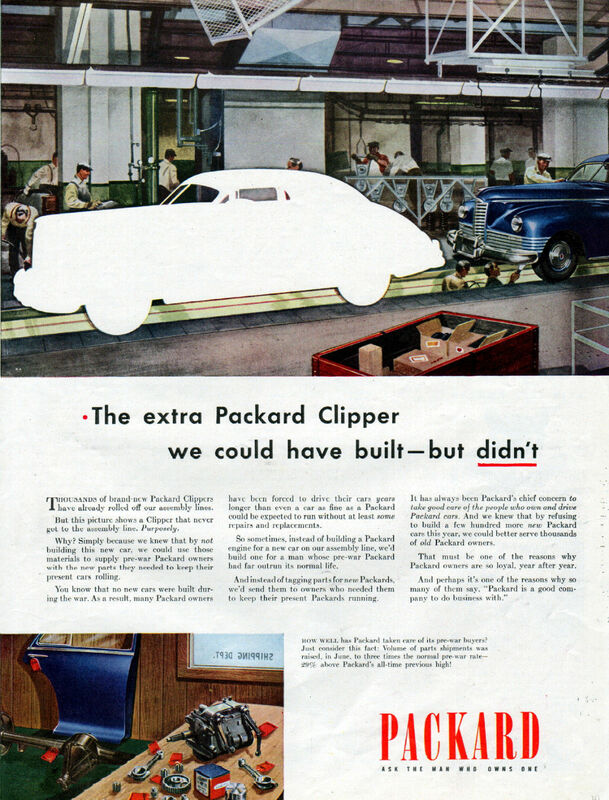 But Packard was way behind in production too. 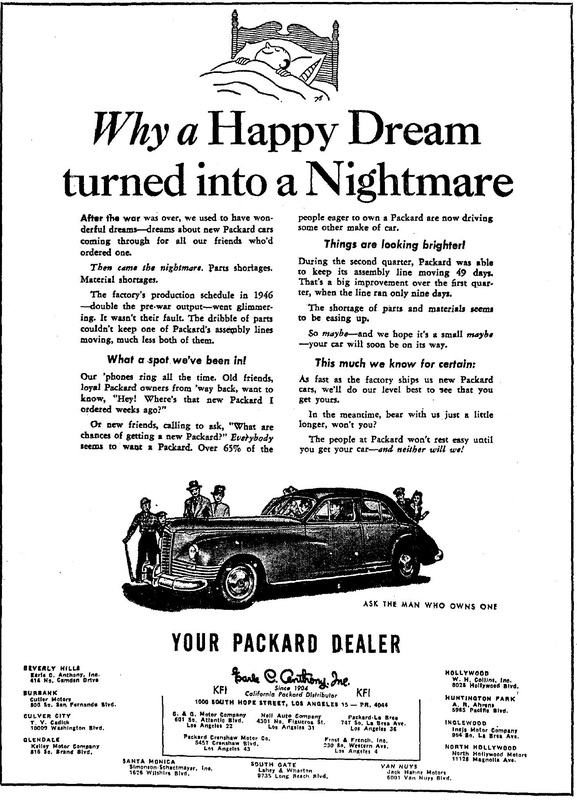 “After the war, we used to have wonderful dreams about new Packard cars coming through for all out friends who’d ordered on. Then came the nightmare. Parts shortages- material shortages.” 8/6/46. Sure, we could’ve built your new car, but we needed the parts for our prewar Packard customer’s cars. 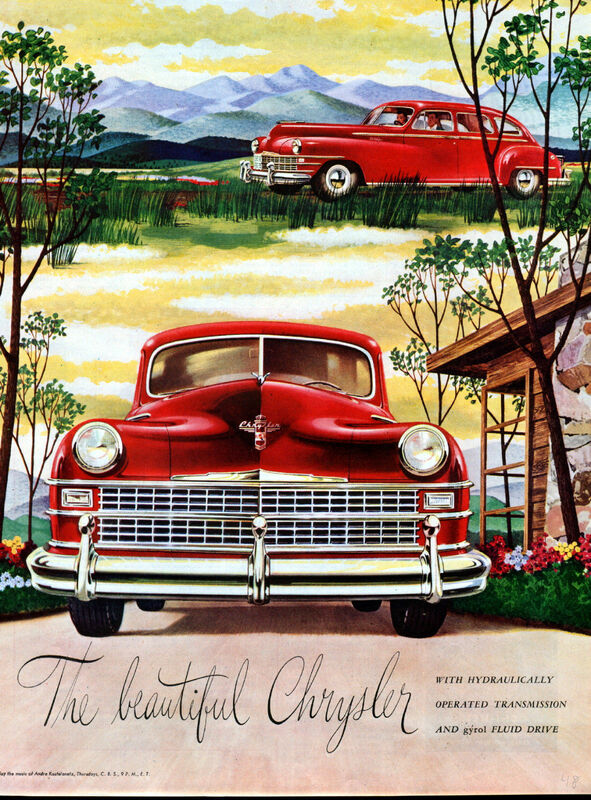 Packard Clipper ad, 1946. 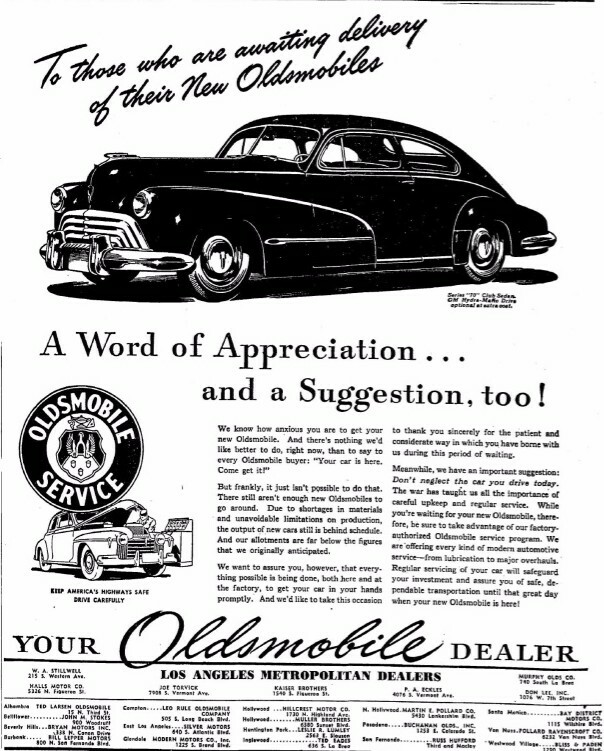 1946 Oldsmobile with Hydra-matic shifting. 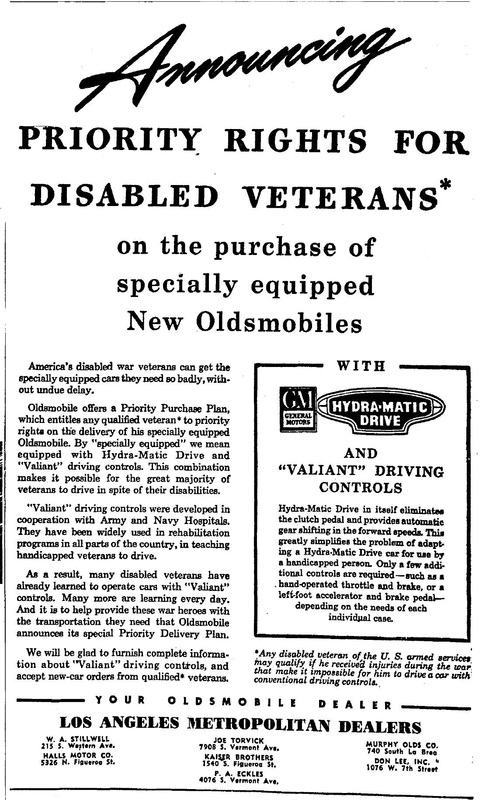 Oldsmobile offered specially equipped models in 1946 that featured hydra-matic drive and “Valiant” driving controls. 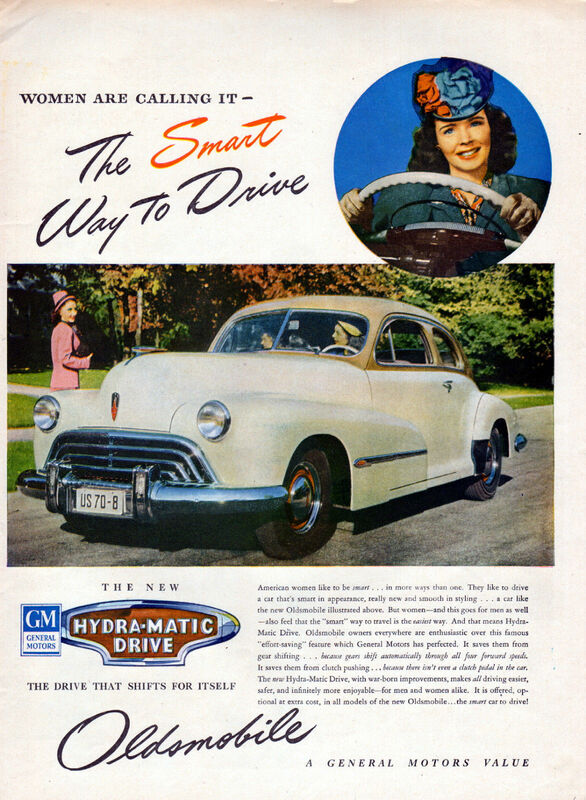 Hydra-matic drive eliminated the clutch pedal, and provided automatic gear shifting. “Valiant” drive controls were developed in cooperation with Army and Navy Hospitals specifically to meet the needs of disabled vets. 9/25/46. 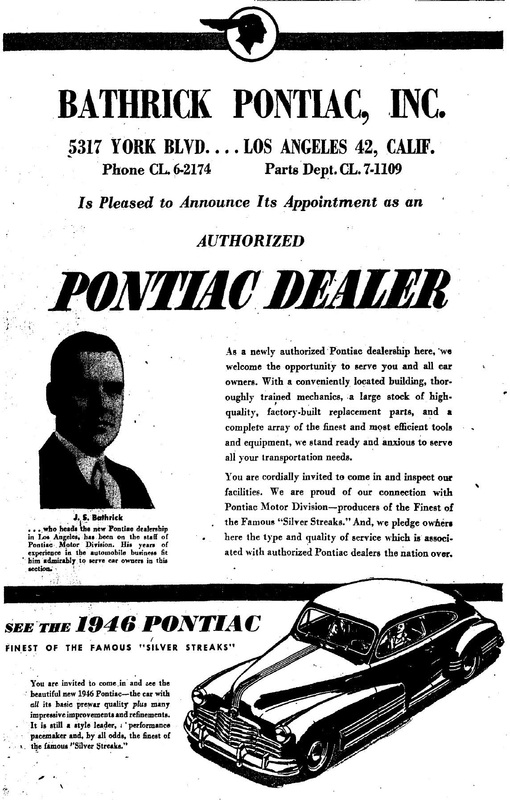 In October, Los Angeles could see (but not get) the new 1946 Pontiacs at Bathric Pontiac, Inc. 10/6/46. 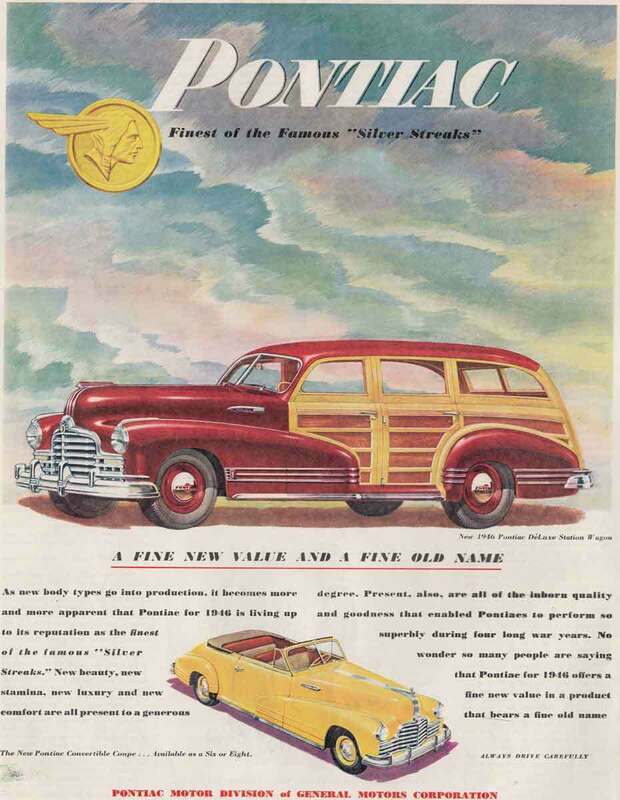 Pontiac, “finest of the famous Silver Streaks.” 1946. 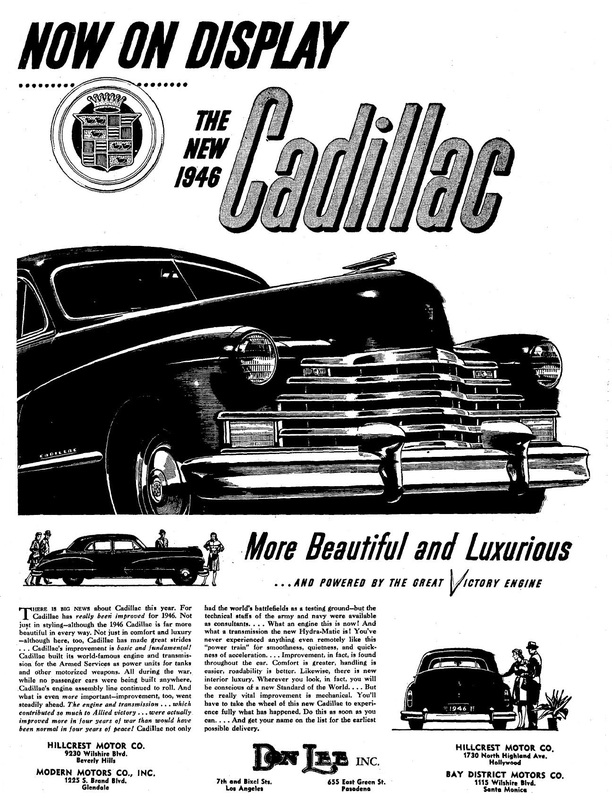 Cadillac took a more aggressive a “you’ll wait and like it” approach. 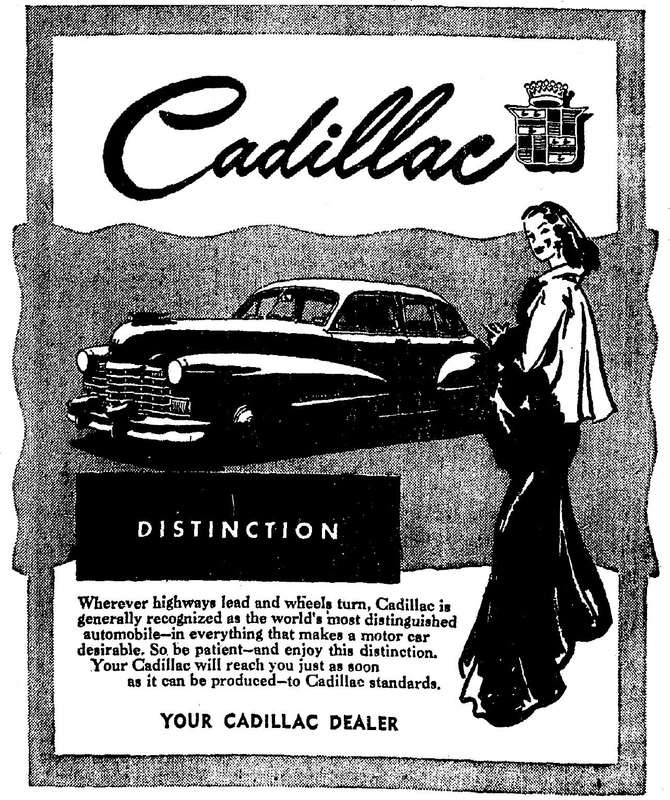 “Your Cadillac will reach you just as soon as it can be produced- to Cadillac standards.” 10/8/46. 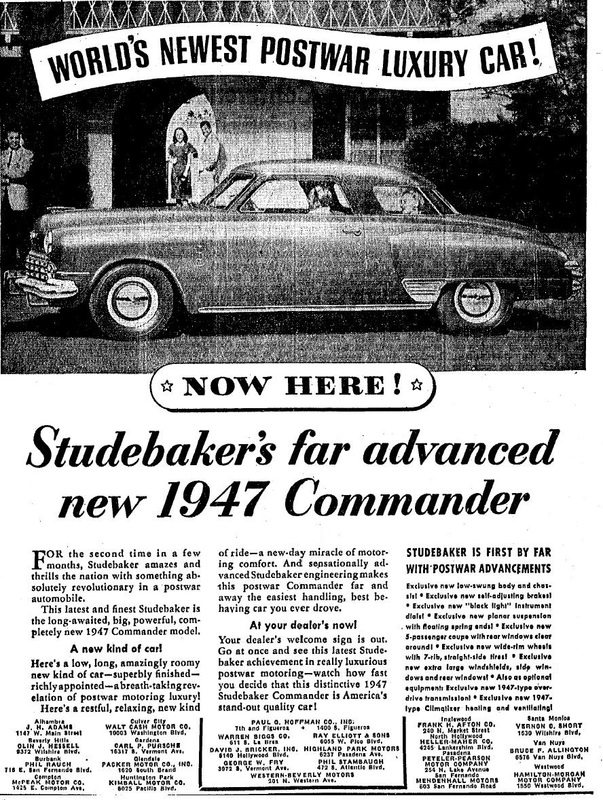 “A Postwar thrill in style and handling ease….” The 1947 Studebaker Commander. 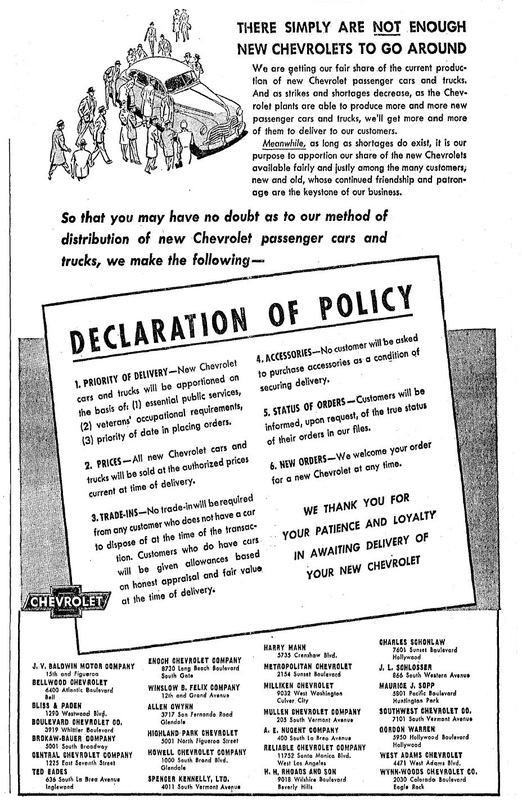 “Look at American in a new Chevrolet,” 1946. Three years later someone realized “USA” actually rhymes with the name of the car and wrote a song about it.